Departing daily from Port Douglas, Poseidon is a 24 metre catamaran, from which you can dive or snorkel on the stunning and infamous Ribbon Reefs of the Outer Great Barrier Reef. You'll be able to see the marine park up close with guided snorkel tours and scuba diving available on board. Certified and introductory divers can participate in up to three dives during their tour in three different locations. Snorkellers can also jump in at the three locations and will get several hours in the water, exploring the reefs and all it has to offer. Back on board you'll find freshwater showers, a licensed bar, an air conditioned saloon and lounging areas on deck. During whale season, guests can even take the opportunity to swim with dwarf minke whales with Poseidon's special permit! 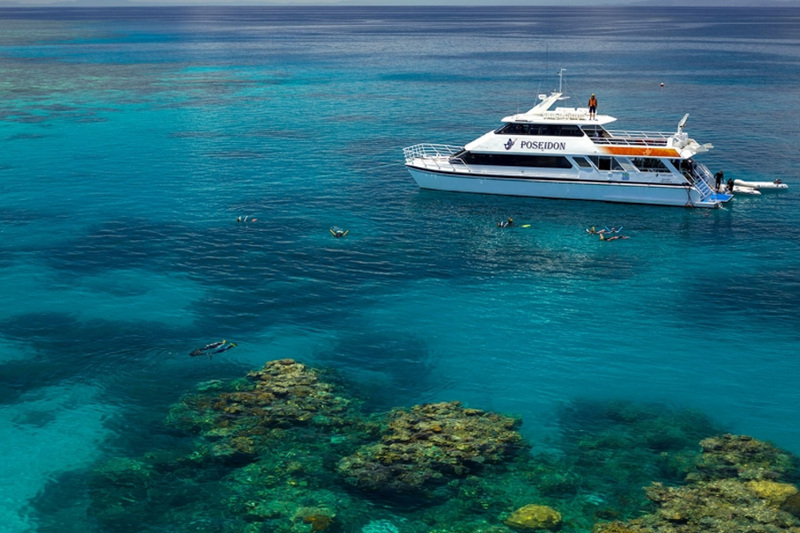 This trip is designed to cater to certified divers who want to explore the Outer Great Barrier Reef during a day trip. Poseidon offers our guests large tanks and computers to increase your time in the water, as well as guided tours every time! You'll get to do drift dives and wall dives for an immersive experience, and check out isolated pinnacles and the abundant amounts of fish surrounding you! Divers are able to experience up to three different dives at three different sights for a diverse and phenomenal reef experience. Divers must be at least 12 years old, and we ask that all certified divers bring alone their certification card. Snorkellers are always welcome on board Poseidon! You'll get to join in for the day at the three chosen sites for the day and snorkel around the shallow and accessible reefs to see the marine life for yourself. Your tour will be guided by our onboard marine biologist who will point out all the amazing species there are to see, while guiding you around the reefs. We'll offer tips and techniques to beginners as well as in-water assistance for those who need it! All snorkelling equipment is provided, including flotation devices if needed. The shallow waters provide some of the best snorkelling in the world, brimming full of funny and stunning marine life. Between the months of May and August, the Great Barrier Reef sees pods of dwarf minke whales as they migrate through the waters off Port Douglas. Poseidon is one of only three boats in the area that allows its guest to swim with these phenomenal animals. We operate under guidelines imposed by the Great Barrier Reef Marine Park Authority, whose interest is keeping all the animals and marine life of the park safe. Groups of 10 people can be positioned on a floating life, ensuring not to disrupt the whales, leaving them in control of the encounter. But don't worry - they are curious animals and usually come by to say hi. Although there is no guarantee of seeing any whales, sightings are frequent during the winter months. The Outer Reef offers clear waters teeming with marine life. Endless numbers of cod, parrotfish, angelfish, clownfish, giant clams, reef sharks, corals, anemones and more await for you to discover and enjoy during your one-day diving experience. Divers will get to visit it depths, while snorkellers get the chance to see the corals sitting near the surface in the shallow coral lagoons for an unforgettable day. Your day with Poseidon will take you to experience diving and snorkelling at 3 different and ecologically diverse reef sites. 8.15am: Vessel boarding at the Reef Marina, Port Douglas. Complimentary tea, coffee served until departure, muffins & focaccia. Coach Transfers from Cairns and Northern Beaches are an additional cost. Environmental Management Charge/Admin: $6 per person is payable by adults and children over 4 years. This cost is payable to Poseidon on the day of travel. Fuel Surcharge: With fluctuations in world oil prices, it may be necessary to apply a fuel surcharge to your ticket price. In such cases, any charge will be collected on departure. For current advice contact your tour agent or Poseidon Cruises. Certain medical conditions and medications may preclude some people from diving. Please contact us for advice or if you have any questions. Minimum age for diving in Queensland is 12 years.